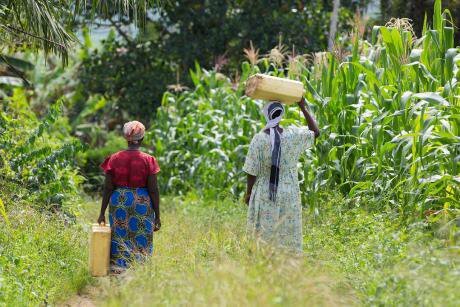 Women have to walk for miles to collect water after being displaced from their land in Uganda. Photo: Sarah Waiswa/Womankind Worldwide.The link between corporations’ rush for natural resources and violations of women’s rights is increasingly evident. The 2016 murder of environmental activist Berta Cáceres – who was leading the struggle of her indigenous community to oppose the construction of a dam on their sacred river in Honduras – showed how deadly the risks can be. Her story exemplifies the struggle of many women in the Global South who are standing up for their rights to dignified lives free from violence. In recent decades, we’ve seen a proliferation of land-intensive, transnational mining and agri-business projects – from gold and coal mining to biofuel and palm oil production – in resource-rich developing countries. Yet, instead of promised prosperity, many local populations continue to struggle with poverty and food insecurity, along with growing conflicts over who controls and profits from high-value commodities and land. Consequences of the corporate rush for natural resources in the Global South, including lost livelihoods, forced evictions, violence and environmental degradation, impact women in specific ways. When women rise up to defend their land they may also face threats and ostracisation from their own communities, as they defy state and corporate power as well as patriarchal notions of women’s roles. Women are the majority of the world’s small-scale farmers and are primarily responsible for providing care, food and water for their families. But their work is often undervalued and unrecognised. When businesses violate human rights, gender-specific impacts remain largely invisible. Many of these violations are caused and exacerbated by entrenched and ‘normalised,’ everyday gender discrimination. Many violations are caused and exacerbated by entrenched and ‘normalised,’ everyday gender discrimination. Women’s financial and physical security is seriously jeopardised by transnational land-based corporate investment, according to a new briefing from UK civil society network on corporate accountability, CORE, and the NGO Womankind. Drawing on research from the Essex University Human Rights Clinic, it shows how women are also routinely denied opportunities to influence decisions regarding land use by overseas and domestic investors. In Uganda, the National Association of Professional Environmentalists, a local NGO, has shown how women are excluded from key decision-making processes due to a lack of land ownership rights. Household and community power dynamics often exclude women from land use consultations and the distribution of compensation. Companies make little effort to listen to women’s voices and incorporate them in investment plans. This week, civil society, government and business representatives are meeting in Geneva for the UN Forum for Business and Human Rights to discuss corporate compliance with human rights and access to remedies when things go wrong. These talks will fail if they ignore women’s voices and do not challenge gender injustices. Companies must explicitly acknowledge gender-specific impacts of their activities and introduce policies and mechanisms to engage and listen to women’s experiences. They must document and be able to clearly show how this informs their activities, so that they can be monitored and held to account for commitments. But we cannot rely on businesses alone to deliver good practice. States should introduce mandatory human rights due diligence, compelling companies to conduct risk assessments of their operations, including oversight of subsidiaries and supplier practices and prominent gender analysis and attention to women’s rights. Prolific corporate human rights abuse is beginning to galvanise international efforts to end it. Today, prolific corporate human rights abuse is beginning to galvanise international efforts to end it. Ecuador is leading a process at the UN human rights council to create a legally-binding treaty that would force companies to uphold human rights and environmental standards across their operations. Last week CEDAW, the UN committee responsible for reviewing states’ women’s rights commitments called on Norway to reconsider its oil and gas extraction policies to mitigate the disproportionate impact on women of climate change. A 2015 French law requires its largest companies to prepare ‘vigilance plans’ setting out measures taken to prevent human rights abuses throughout their operations. Several other European countries are now considering the introduction of mandatory human rights due diligence laws. The EU should build on this momentum, introduce a common standard and require all member states to introduce such legislation. These measures could enable women whose rights have been violated to take multinational companies to court in the countries where they are headquartered. Cases like these are not easy to mount, but currently most communities are restricted to remedy through local judicial systems where legal infrastructure may be limited and corruption may be widespread. States and corporations must show that they take women’s rights seriously. They can no longer pay lip service to these rights, or relegate responsibility for them to profit-hungry corporations and patriarchal decision-makers. Women’s voices and women’s participation must be at the centre of talks and policies on business and human rights.